language learning | Brian Jane's Blog. This morning, Judi got up early (6ish) and worked from home for a couple hours. I slept until 7:30 and lolled around on the couch until I took Judi into work. Did I mention I can drive a car again? It’s one of the many benefits of getting this sleep therapy done. Hebrew Language and Zipf’s Law and–Gawd I’m Exhausted. I feel like a giant aleph is sitting on my chest. This isn’t a good thing, mind you. I’ve been struggling today with my Hebrew vocabulary which is mostly hook-free. By hooks, I mean those cognate terms that would help me to recognize (and ultimately remember) the stack of Hebrew words. Rich Israel did it, the stinker, but in Biblical Hebrew which has traditionally had a graduated approach. First you learn the words that appear 5,000 or more times in the Bible. Then 1,000 times. Then you tackle the ones that appear 750 times or more, and so on. Before you know it, you can recognize huge chunks of the Bible, in Hebrew, with a little grammar and syntactical practice. I was a 50%er in my Hebrew studies; that is, on any given page, I could cobble together half the text thereupon without a lexicon. That is probably good enough for my 9 units of Hebrew study, and most people would salute that as an accomplishment. According to Zipf’s law (it’s amazing the crap I’ve learned in the last 20 years), the most frequent word in a language will occur approximately twice as often as the second most frequent word, three times as often as the third most frequent word, etc. I mention this because, well, 50 percenters are practically worthless, or at least not anywhere near a level fluency that will get them a job at National Archive. 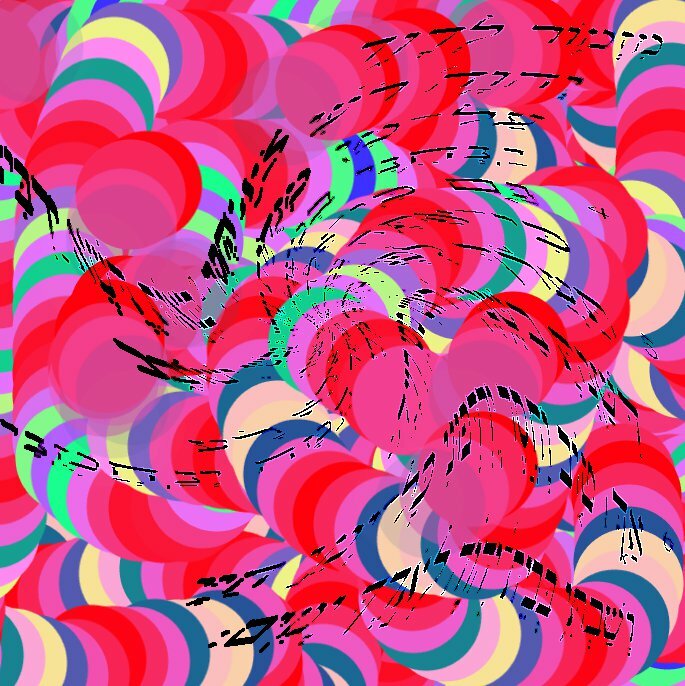 This is the text of the 23rd Psalm in Hebrew, twisted up and superimposed on a background of clown vomit. It just about describes how I feel right now. I know it’s silly. Can I learn a year’s worth of Hebrew fundamentals in 3 or 4 weeks? Yeah, I think I can. But I’m rather insane that way. It’s been taking up large amounts of my time as I compare verb tenses and struggle my way through nouns and noun phrases. Hebrew isn’t at all helpful, throwing road blocks up at every turn. I recently found a more “academic” course that was free. This has helped substantially. Most free online stuff is geared toward travelers. If I want to say words like fare, taxi, suitcase, hotel, and airport I’m all set. But I doubt I’ll be cataloging travel brochures. I’m equally certain I won’t be cataloging from the corpus of Biblical Hebrew words, which, I recall, focused heavily on words like guard, and hearken, manservant, and chariot. There’s gotta be a happy medium that I am missing, and I’m just demoralized and feel like I’m forgetting every single word that I come across, and needed someone to talk to. Also, I forgot to take my antidepressants this morning. No surprise there. Thank God for my wife, who pointed out that learning a language in 4 weeks nothing short of phenomenal, and I shouldn’t beat myself up over my mistakes. Yeah. I’m a perfectionist. Beating myself up is what I do best! Well, back to the grind. Maybe a good eight hours’ sleep will do me well. As they say in Hebrew, laylah tov, and lehitra’ot. The last few days, I’ve been practicing my French vocabulary. I don’t get much chance to actually use my French, but it would sure be nice if I had somebody to converse or write with. I suppose I could write my blog in French, but that wouldn’t be very nice for anybody, other than my one Francophone Canadian friend, who could then make fun of me. The word "love" in several languages. Why not? I’ve never been one to make New Years Resolutions. Somebody, the other day asked me why not, after she told me she gives them a lot of thought this time of year. I’m not sure. It’s possible I don’t want anyone to catch me failing. It’s easier to slide through life with no goals or objectives–daresay dreams–than to have them crushed?